I should have been the picture of wellness. I was 36, happily married with three wonderful daughters. I didn’t smoke or drink and was considered a “health nut” when it came to my eating habits. I had been exercising regularly for years. I looked fine and felt fine … but I was slowly dying inside. June 27, 1990 was the day my world came crashing down. A doctor stood at my bedside after examining my colon with a lighted scope and told me he had found a tumor. “Do you think it’s cancer?” I blurted out. He nodded affirmatively as his eyes filled with tears. I can still see my husband’s ashen face as he stood at the foot of the bed. I knew that this was his worst nightmare revisited as some 20 years earlier a doctor had stood by him and his first wife telling them she had Lou Gehrig’s disease. I began to sob and yell “no” as if somehow the force of my words would make my diagnosis not true. I was hyperventilating and I saw the doctor motion to the nurse to put more sedative in my I.V. I kept thinking how all the nurses would go home and tell their families about the patient who “lost it” that day. There are no words to describe how it feels to be told that you have cancer at age 36, when your daughters are 8, 10 and 12, and your husband has already watched one wife die a slow, debilitating death. Shocked and devastated are too mild. It was as if someone had hit me between the eyes with a brick, made me get back up and then hit me again. I entered the hospital three days later, praying God would miraculously take away the tumor and imagining how I would go on television with my healing story. At other times I imagined the cancer was rampant throughout me and they would close me back up without a word. Neither of those extreme scenarios came to pass. Instead the tumor was removed and my colon resectioned. If the cancer was caught in the early stage, I would be considered cured and no further treatment would be needed. If it was advanced, I would have at best a 50 percent chance of survival. The pathology report came back three days later: five of the surrounding lymph nodes had cancer. Now I was really frightened. This nightmare was not going away. I was consumed with thinking about dying. When I looked at my daughters I would cry. Would I see them grow up? Would they be all right without me? I started chemotherapy three weeks later with an oncologist named Dr. Marc Hirsh (www.marchirshmd.com), who had a practice a few miles from my home. I knew he had an excellent reputation as a physician and I knew he was a man of great faith. But there was no way I could know that God had something more in store for our lives. 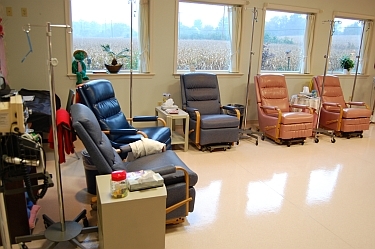 I was scheduled for weekly chemo treatments for one year. The drug combination I was getting was comparatively mild and it usually took weeks for patients to feel any side effects. Not so with me. I was sick from the onset, but the anti-nausea medicine made me so sleepy I couldn’t function, so I chose to be sick instead. I developed mouth sores, my waist-length hair kept getting thinner (although I did not lose it all), I was terribly fatigued, food had no taste. I lost 20 pounds and the air outside smelled so bad some days I had to hold my nose. On top of all the “normal” side effects, I was allergic to the main chemo drug, causing my eyes to water profusely and my nose to run constantly. The palms of my hands and the soles of my feet turned flame red and felt like they were on fire. My joints swelled and I could hardly bend my fingers. I had to walk on the sides of my feet and my skin peeled off them three times. At this time I counted people in 16 states praying for me and my pastor-husband. Why was nothing going easily for me, I moaned. I now believe God was allowing me to suffer so I could have a ministry to suffering people. If you ever have felt God leading you to do something, you know you won’t be at peace until you agree. I started the Cancer Prayer Support Group in October 1991 with four people. My intent was to have a one-hour, once-a-month meeting. That shouldn’t be too depressing, I reasoned. But I quickly could see that the people coming needed more support than that and strangely enough I felt better after the meeting instead of worse. We started meeting twice a month and hundreds of patients and their families have come to the group over the years. I’m glad I’ve had to take back those words as my support group brought me some of the greatest joy in my life. In fact by the time I reached the fifth anniversary of my cancer surgery July 2, 1995, I was secretly praying that somehow I could quit my public relations job and volunteer my time with cancer patients. However, I could foresee no logical way this could happen because our oldest daughter would be heading for college the next year and my income was sorely needed. But in April 1996 I got a call from my oncologist asking if he and his wife could talk w ith my husband and me (his family and mine had become very close friends over the years as we socialized, vacationed and prayed together). Marc said they had been praying about something for a long time and felt it was the right time to ask me. He proceeded to offer me a job in his oncology practice as a Patient Advocate who would minister to the emotional and spiritual needs of cancer patients and their families. And that is just what I did beginning in May 1996. When we began this venture there were no models to follow and no how-to books to read. So we prayed and we “made it up” as we went along. In May of 2015 I retired from that full-time job, but not from my ministry to cancer patients and their families. And my message is still the same: This life is not always fair, but this life is not all there is. God loves you with an unconditional love. He has the power to work together all things for good for those who love Him. . God is able to do immeasurably more than we can ask or imagine. He can be trusted. I know … my life is living proof.